Do you need help clearing your drain? Tree roots can often break into the line, causing roots to spread all through your sewer line. Foreign objects that don’t dissolve properly can also be the source of sewage blockage. Older sewer lines may start to deteriorate and collapse, preventing sewage from flowing properly. All of these factors can cause a sewer blockage that is not only frustrating, but that can be very costly to clean or repair. Kitchen drains and toilets are often treated like garbage cans, causing build-up and blockage. Your household drainpipes need to remain clean for your own health and safety. When you have a clogged drain in the kitchen or sewer, the buildup can be a threat to you and your family’s health. Even if you carefully monitor what goes down your drain, it’s almost impossible to prevent buildup over time. If your kitchen or bathroom drain has endured grease, food or hair for too long, it may be time to clean your drains. If your bathtub fills up when you take a shower or your sink takes minutes to drain, you may want to talk with professional plumbing technicians from Armstrong Plumbing about sewer drain clearing. HOW CAN WE HELP YOU WITH YOUR SEWER PROBLEM? 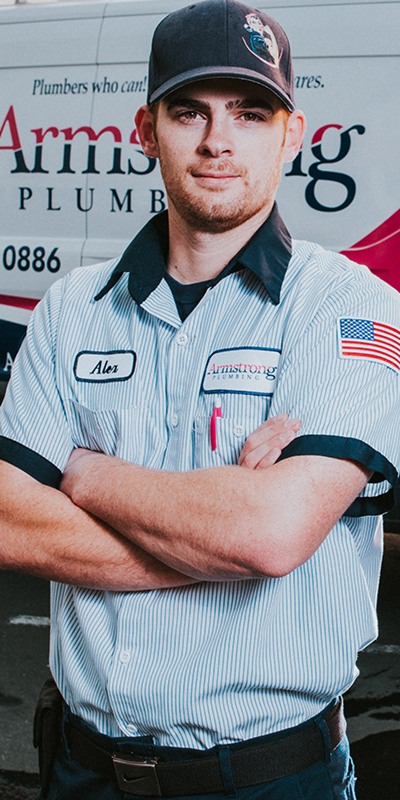 Major sewer line problems are any homeowner’s nightmare, but Armstrong Plumbing Sacramento is always here to help. Whether you have broken, cracked, offset or collapsed pipes, blockage, corrosion, bellied pipe, leaking joints, root in the sewer line, or off-grade pipes, our plumbing experts are available 24/7 emergency plumbing services. When you have a drain clog that won’t clear, Armstrong Plumbing Sacramento can help. Our team of professionals will diagnose the problem. Armstrong Plumbing can snake your drains, hydroplane your pipes, or inspect your line with a camera to find the root cause of the clog. If you’re having slow and backed up drains, contact your Sacramento plumber today. The past several years have allowed for several advancements in trenchless plumbing technologies. From directional boring to Cured In Place Pipe Liners, we now have the ability to get through almost any situation without the need to destroy your landscaping. Replacing your entire water or sewer service can be done in a short amount of time. If you need to solve your sewage and drain problems, contact us at (916) 978-1084 to schedule a cleaning service. You can also request an estimate online at any time. Need An Estimate For Sewer Drain Clearing or Replacement? Have a question about drain clearing?